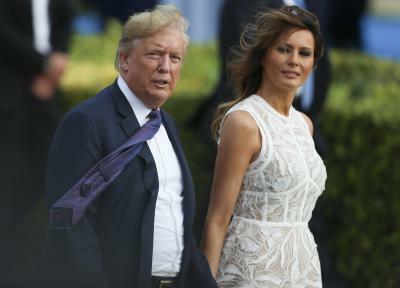 London July 14 (IANS) US President Donald Trump and his wife left for Glasgow on Friday after having tea at Windsor Castle with Queen Elizabeth II. Trump is expected to play golf during his time in Scotland where he and the first lady Melania Trump will wrap up their stay in the UK with a private visit. The President concluded the official part of his visit to the UK his first since taking office last year with a meeting over tea with the 92-year-old queen at Windsor a royal residence Efe reported. The two also watched a military parade at the castle. Trump had met earlier on Friday with British Prime Minister Theresa May at her country residence Chequers Court near the village of Ellesborough. The two exhibited strong chemistry and May said Trump had agreed to "pursue an ambitious US-UK free trade agreement" once Brexit (the UK s withdrawal from the European Union) takes effect on March 29 2019. Trump for his part said the Prime Minister was an "incredible woman" and apologized to her for an interview published by British tabloid The Sun in which he criticized her Brexit plan. That interview was published as Trump and May were attending a gala dinner on Thursday night at Blenheim Palace along with scores of British business leaders. While Trump was wrapping up his stay in England tens of thousands of people took part in mass protests Friday in downtown London and across the UK. "Say it loud say it proud Donald Trump s not welcome here" was the most commonly heard slogan at the demonstrations in the British capital. The Women s March London and Together Against Trump platforms organized the largest demonstrations which ended at Parliament Square and Trafalgar Square respectively. Organizers said the women s march drew as many as 50 000 people while the second brought around 100 000 out on the streets.